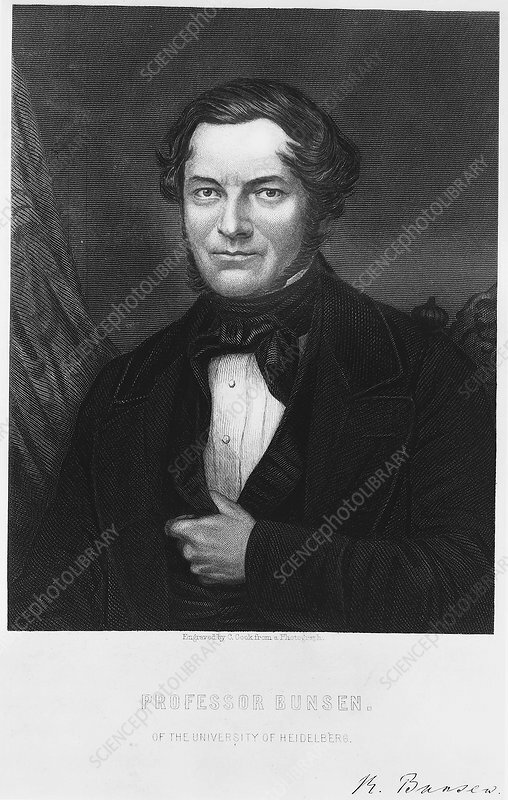 Robert Bunsen, German chemist, 1850s. Signed portrait; Bunsen (1811-1899) is widely considered one of the greatest experimental chemists of the 19th century. He was a pioneer of chemical spectroscopy, and the inventor of the Bunsen cell, the Bunsen ice calorimeter and the Bunsen burner. Spectroscopy is the branch of science concerned with the investigation and measurement of spectra produced when matter interacts with or emits electromagnetic radiation. Artist: C Cook.